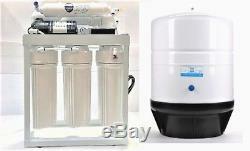 Light Commercial Reverse Osmosis Water Filter System 300 GPD - ROT-14 Tank. This Compact Reverse Osmosis Water Filter System comes with a booster pump for better quality of water production. Frame Stand Mounted Reverse Osmosis Water Filtration 5 Stage System. Stage 1: Sediment Water Filter 5 Micron. Stage 2: Coconut Shell Carbon GAC Filter. Stage 3: Activated Carbon Block 5 Micron. Stage 4: TFC-2012-150 GPD x 2 RO Membrane (300 GPD). Stage 5: Post Carbon GAC Filter for odor and taste. ROT-14 Gallon Capacity RO Storage Tank. Feed Water Adapter 1/2" MIP x 1/2" FIP x 1/4 Push in type Tube Quick Connect. Drain Saddle Valve 1/4 Push in type Tube Quick Connect. Tank Valve 1/4 Push in type Tube Quick Connect. RO Water Inline Ball Valve 1/4 Push in type TUbe Quick Connect. RO Membrane Flush Inline Valve (Regular flushing of membrane extends membrane life & better water quality). Reverse Osmosis Membrane are most efficient at 77 F Water Temperature, 65 PSI Water Pressure and 250 PPM. Note: Average loss of RO water production is 2% for every -1F (77F) Water Temperature. Item that has been installed or used will not be accepted for return. Titan Water Pro is your "Clean Water Solutions". The item "RO Light Commercial Reverse Osmosis Water Filter System 300 GPD RO Booster Pump" is in sale since Tuesday, March 5, 2013. This item is in the category "Home & Garden\Kitchen, Dining & Bar\Small Kitchen Appliances\Water Purification\Water Filters". The seller is "titanwaterpro" and is located in Canyon Country, California. This item can be shipped to United States.